Discussion in 'Politics, Religion, Social Issues' started by rdowns, Jul 11, 2014. A small win for the people. 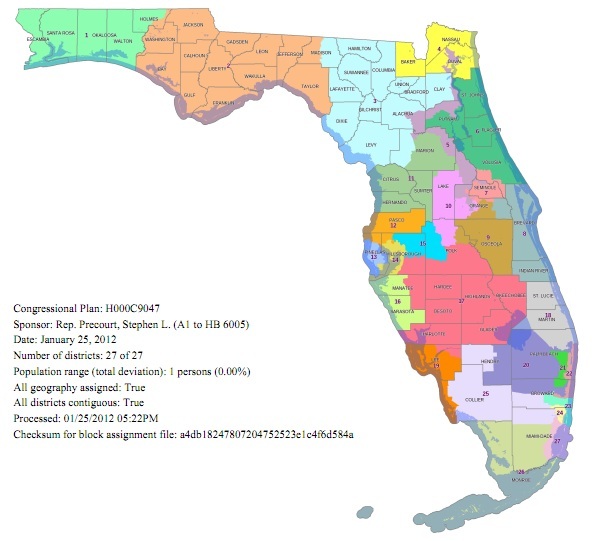 Floridas congressional districts are some of the most GOP-friendly in the country. Although President Obama won a narrow victory over Mitt Romney in Florida during the 2012 presidential election, Republicans control 17 of the states 27 congressional districts. That means that, even though Obama won a majority of the votes cast by Floridians in 2012, Romneys Republican Party controls nearly two-thirds of Floridas U.S. House delegation. If neutrality and fairness is a real standard for Democracy, Gerrymandering should be illegal period. Fingers crossed. Although I acknowledge that gerrymandering has been perpetrated by both major parties, I wonder how proponents of gerrymandering today argue it's necessity, argue why a district should be constructed in something other than minor variations, a basic rectangular shape? I thoroughly agree with this ruling, although I suspect it could get difficult to determine what boundaries were drawn for specific political reasons, and which were drawn just because. aren't drawn this way for a specific reason. The little finger on the south side of the Chicago map serves to exclude the jail and prison from the pink district. rectangular? Because naturally defined places aren't rectangles. Physical boundaries like rivers and mountains often make a lot of sense. I assume that the up vote you got are from a forum member who supports gerrymandered districts for political advantage. Did you look at the maps I had links to? I understand what gerrymandering is and am not in favor of it. I'm going to assume that the up vote I got is from someone who realizes that solutions to gerrymandering need more thoughtful suggestions than saying everything should be rectangular. Now, it must be said. The margins can matter a great deal. It would have been helpful if you had said this at the start and I made an assumption. I made an anti-gerrymandering statement and you countered it without stating that you were against it. My apologies. And I've acknowledged that Democrats have also done this and it should be prohibited by any party. When I said rectangular or basic shapes I ment something that looked more like this (although this is a map of counties), not spider webs and would include population numbers in the calculation. Whatever methodology is used, political gain can't be one of the criteria. Can you agree with that? Just wondering if you la grid of rectangles was laid with weighted voting based on population, would this be unfair? Just wondering if you la grid of rectangles was laid with weighted voting based on population, would this be unfair? The problem, I think, is that we have the current, baseline reality, whatever that is in each state. If we change it to something else, whatever that is and whatever criteria we use to establish it, it's pretty easy for politicos to do the math and see who that change will advantage. Weighted voting doesn't really apply here because I think we're talking about congressional districts, so states need to be divided however many ways they have congressmen. My suggestion was that the rule should be congressional districts should, to the extent possible, follow county lines. I'm assuming counties mean something within states and have coherent county governing structures. I could be completely wrong about that. If you look at the Washington State congressional map I linked to, it matches up pretty closely with the county map you posted. Also, what I posted about democrats doing this too themselves, meaning we put ourselves into geographically confined areas, not that democrats use redistricting to disadvantage Republicans when the opportunity presents itself. If democrats want more power, we need to start living less in cities and spread out to more rural areas. Another option would be to abandon the idea that congressmen represent parts of a state and have state-wide elections for them. Maybe based on a popular vote (41% democratic, 43% republican, 11% libertarian, and 5% green), 11 congressmen would be apportioned as 1 libertarian, 4 dems, and 5 republicans, and 1 green. I think this is a pretty terrible idea. Georgia's districts tend to follow the county lines for the most part except right in the Atlanta metro. I don't believe that our districts are poorly drawn from a political standpoint. Not surprisingly, the 2nd district is going to be Democrat since it includes the Albany area. The 4th, 5th and 13th are Democrat, as they include metro Atlanta's urban areas. The 6th and 7th are the more affluent suburban areas so it isn't unexpected that they would be Republican. The 1st, 10th, 9th and 14th will be Republican for a long time to come, very conservative areas. They look reasonable to me. I follow the rule that if a district cannot be reasonably represented by a shape with 5 corners then something fishy is going on. Not necessarily. I live on the top of district 14, and I know Catoosa, Dade, Whitfield and Walker have a lot of political mixing and overlap with the far more liberal Chattanooga metro area. Those are also the counties with the highest population of that district. Especially when the Western border is a strip of concrete on I-294. I thought Floyd, Paulding and Whitfield had higher populations? eta:After checking Whitfield has a higher pop than Floyd. None of the 14 districts switched parties and only one race (12) was close. So Republicans will get 9-10 seats out of 14 (64%-71%) in a state where 59% of the people who voted R or D voted Republican. Do you think 6 and 11 are possibly a little gerrymandered? It looks like some of that county right below the 6 might fit more logically with 6, traded for some of the county to the right of the 6. The biggest problem for Democrats though is too many live in 4 and 5. The 14th, Tom Graves was split from the 9th. Tom took over 70% of the General Election votes. In 2010, the Democrats didn't even oppose the 9th. In 2012, Doug Collins also pulled 70% plus. Those districts are solid in the red column. The advantage of first past the post is that you know who your representative actually is. If the democrats live in a more geographically concentrated area then they will get less seats, and that's how it goes. 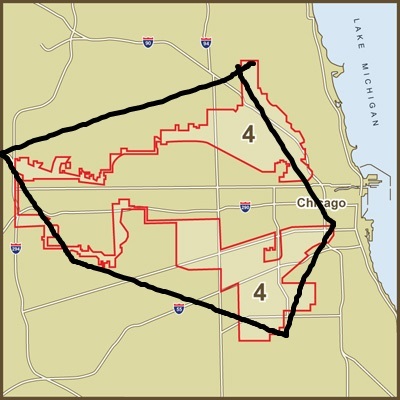 What isn't acceptable is what has happened in Chicago where the gerrymandering means there isn't proper representation. You are also likely to get lower turnout in districts where there is only one candidate, unless you are very excited by them, or want to vote for the school district or whatever, what's the point? You do realize that the Illinois 4th and 7th are both Democrat districts, right? In 2011 the Democrats redrew the districts, as they had control. It's called the Latin Earmuffs. The Puerto Ricans on top and the Mexicans on the bottom. It was done to water down the Hispanic vote and keep it in one district. Just because it was done by democrats doesn't make it any less pathetic. Can gerrymandering be done for positive reasons? If this district hadn't been created, the Hispanics wouldn't have a Representative. Now granted that laws were written to keep lines from being drawn to deny minorities seats. However, this district was created to help a minority get a seat. Of course, it takes the seat from another minority in doing so. Personally I think gerrymandering is gerrymandering. Were you against Affirmative Action? Just for the record, I'm not a fan of gerrymandering, either. However, it's the rules of the game. The party that controls the State Legislative body in a census year gets to determine the district boundaries. 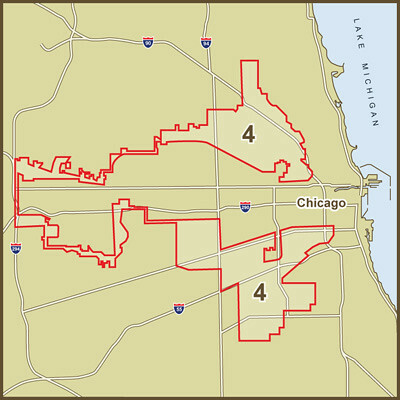 The Illinois 4th is considered to be the most gerrymandered district in the US. It is also considered to be one of the most Democrat districts in the US. However, the districts around it are also Democrat districts. The Democrats controlled the State General Assembly and Senate in Illinois. They made this district because they believed it would help them keep a Democrat Delegation in the House. Oddly, the court hasn't ruled that district to be unconstitutional. So...a state court in Florida has jurisdiction in Chicago? That is a rhetorical question, right? The Chicago district has been taken to court a few times as well. But so far it still exists. That was a difficult article to read. Was he saying District 5 should be left alone or broken up? Or broken up in another fashion? District 5 should be broken up.